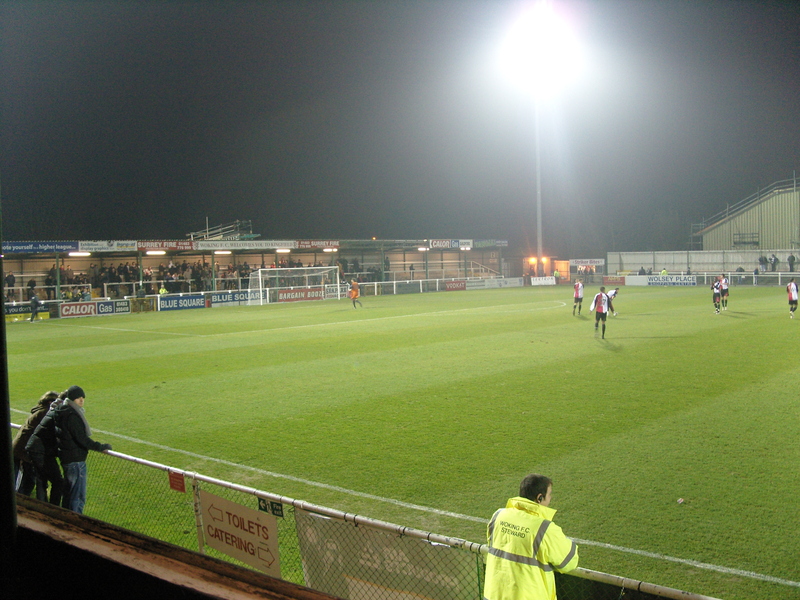 About the Kingfield StadiumThe ground has an impressive and fairly new single tiered stand situated at one end of the ground. This stand, the Bellway Homes Stand, towers above the rest of the ground. 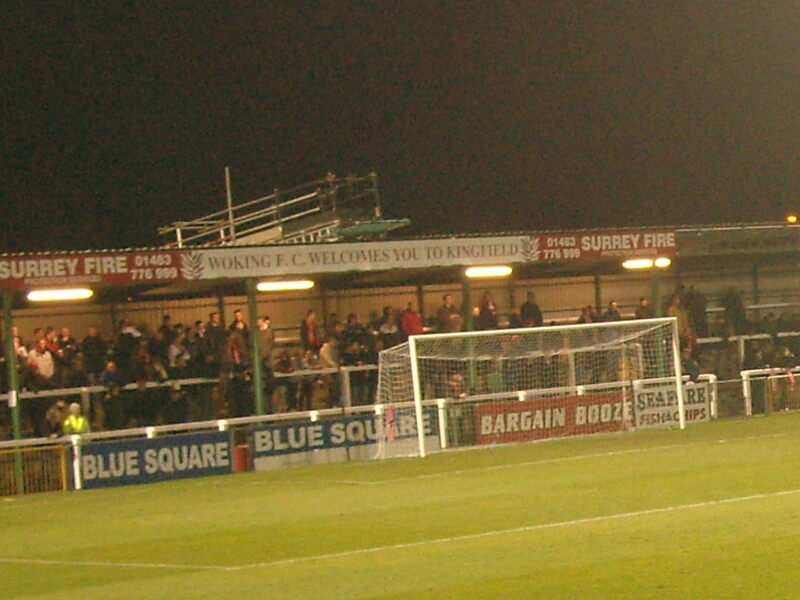 At the other end is a small covered terrace, called the Kingfield Road End, whilst on one side there is a small open terrace. This terrace looks a little ugly as it has quite large warehouse type structures, sitting behind it. On the other side are a couple of small strange looking, covered seated stands, a portion of terracing to one side and some portakbins offices at the other end. However, one nice feature is the abundance of greenery, with lots of trees surrounding the ground.How to get to the Kingfield StadiumWoking train station is about a mile away from the ground and is around a 15-20 minute walk. The station is served by trains from London Waterloo. Exit the station on the opposite side of the station to the town (Station Approach/Oriental Road side). Turn Right down Station Approach and at the bottom, turn left onto Claremont Road (the A320). At the end of Claremont Road turn left on Kingfield Road and the ground is over the road on your right. If you are driving then leave the M25 at Junction 10 and take the A3 towards Guildford. On approaching Guildford turn right onto the A320 towards Woking. On entering Woking turn right at the roundabout into Wych Hill Lane, towards Old Woking (A247). This road leads into the A247 Kingfield Road and the entrance to the ground is down on the right. How to get a ticket for the Kingfield StadiumWith average attendances rarely breaking the 2,000 mark, and a capacity of doubel that, getting a ticket on the day of the match is not problematic. Prices are £15 for a seat in the main stand and £13 elsewhere. Prices are reduced for games such as the Setanta Shield or the FA Trophy matches. Our Last Visit – Woking 1 Salisbury City 2 – 16th December 2008The FA Trophy, for those not in the know is the Non League FA Cup Final. It has been for many years the highlight in the calendar for the smaller teams and now it is back at Wembley Stadium, as opposed to Villa Park or The Boleyn Ground it has rediscovered its magic. The tournament started in 1970 and since that first final at Wembley when Macclesfield Town beat Telford, the trophy has been won by the likes of Wycombe Wanderers, Colchester United and Morecombe who have gone onto gretaer things. It has also been won by the likes of Enfield (on two occasions), Dagenham (before they wed Ms Redbridge), Wealdstone and Matlock Town who haven’t gone onto better things. In recent years the competition has been won by surprise outfits such as Burscough of the Unibond League, Canvey Island who are now in the Rymans and Hednesford Town. Last season Ebbsfleet United won the trophy for the first time in front of over 30,000 at Wembley. As I missed out on my “road to Wembley” for the FA Cup run – failing to follow Grays Athletic to Carlisle was never going to be an option, I thought I might try it with the FA Trophy. I realise that the competition actually started on the 4th October when Marlow beat Cirencester but better late than never I always say, especially when I get the last train home after “only going for a swift half after work”. At the first round stage I decided to randomly pull a tie out of the hat to go to. On first attempt I got Durham City v Harrogate Town – er no…Second attempt was Workington Town v Kings Lynn which again was ruled out as being too far up north! Then I realised that the draw was regionalised and after sorting out anything north of Watford (well Birmingham actually) I drew out Woking, also for some bizarre reason known as The Cards. 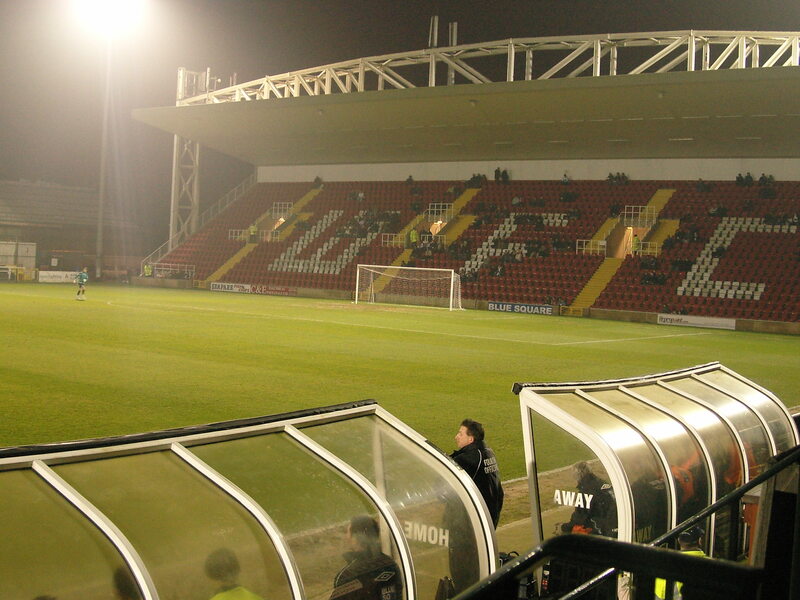 Woking had been a club I had never been to – no real logic behind that as it was close enough to London to do after work and they had consistently played at this level for a number of years. They also had some history in the FA Trophy, winning it in 1994, 1995 and 1997. Woking are also one of those clubs that has challenged for a Football League spot on a number of occasions in the past decade, yet has always fallen short in the end. The past few seasons have seen a number of high profile coaches come and go including Glenn Cockerill, Frank Gray and more recently Phil Gilchrist. The problem the team had faced this season was simply a lack of goals, with some key players still ruled out through injury. However, they could take some hope from the fact that their opponents Salisbury City had been forced to off load a few more players since my visit to their rural home a few weeks before. They had recently lost at home to Woking in the Setanta Shield as well as the league meetings so came into this match with some trepidation of a hatrick of defeats to Woking. It would be interesting to see what the crowd would be as the clubs are only separated by fifty or so miles. The Kingfield Stadium is certainly a much better place to watch games that Salisbury’s rural setting. The new main stand (situated behind one of the goals) is the focal point of the stadium but is one of the more impressive stands in the Blue Square Premier. But as with all good plans I was thwarted by events out of my control – in this case the torrential rain that not only caused this game to be cancelled, but its subsequent re-arranged date meant my trip to Eastbourne on Tuesday was now off as well. This was a shame as I was looking forward to a afternoon out in Surrey. The club had been very helpful so far and that is always a good sign of a well run club (Paul the press officer even phoned me to tell me the game was off before I travelled), and I was also due to go and see Mr Grumble’s new baby as he lived close by. As always I have a plan B but this (Welling Utd v Weymouth) fell by the wayside, as did C (Chesham) and D (Bognor Regis). Amazingly Histon, with that dreadful pitch from Tuesday was still on. But I couldn’t justify another trip up the M11 so an afternoon of ironing in front of Jeff Stelling beckoned. So Tuesday night beckoned and my original plan to see the little balding, grumpy ones (the one in nappies and the one who will be in them soon) fell by the wayside again thanks to an accident on the A3, so I headed up to Woking for 7pm and availed myself of some of the fine cuisine on offer. Whilst the stadium really had the feel of a lower league club, the food was top notch and was well worth the early entry into the ground. The ground…Well it is certainly unique! The new very modern stand behind the west goal is certainly the focal point of the stadium, and would not look out of place in most top league grounds. I am sure that somewhere within the club there is a vision to transform the stadium with three similar sized and designed stands, but finances are obviously very at the top of the agenda in the Non-Leagues. Woking chairman David Taylor had been very vocal about the concept of regionalising the league even at this top level to cut down on the unnecessary costs teams are incurring. There is alot of logic in this view, especially for those teams who decide to go part time. In fact I would go back to my comments from last week when I said that there was no real reason why some lower league clusb could not compete on a part time basis. This was never going to be a game to catch the local imagination. A cold and dark midweek night, in the middle of the Christmas party season for a game that most fans did not care if it was won or lost. However, the 500 brave souls, including the 67 from Salisbury who seemed happy standing around the portakabin toilets on the far terrace were treated to a game of high tempo, if at times low quality football. You could not fault either side for their commitment from the first whistle. Both sets of players tore into each other, determined to try and avoid a draw that would add further pressure to the already crowded fixture list. After Woking went close in the 5th minute when a incicive run down the left flank was so nearly met by Denton in the penalty area. The tall centre forward, on loan from Huddersfield Town was obviously miffed by this and shortly after took out his frustration on the Salisbury full back with a late challenge and saw the first yellow card of the night. At this point I picked up the programme and saw an article about the Woking player Tom Hutchinson. Wow – spooky! Mr Hutchinson has been part of my Sutton United team on Football Manager for the PSP for three seasons now. He is permenantly injured and will not leave despite being on the transfer list for most of this time (my predecessor had put him on a 5 year contract the fool). I looked at the picture in the programme and realised it was the one and same guy sitting behind me helping out on the match commentry. Now I had a dilemma, a dilemma where my virtual world meets the real world. Should I say something about his fitness regime or just stay star struck? In the end play moved on with me biting my tongue, forever in the knowledge that I could have changed destiny! The remainder of the first half was played at the same pace without much quality, with chances few and far between. Salisbury’s Ademeno went close with a smart turn and shot that was well saved but the main talking point of the half was when the referee decided to substitute himself on the half hour mark. He showed no sign of injury or illness and was controlling the game well. Personally I think that he was also a PSP FM08 player and could not compromise himself by refereeing his team. Of course his replacement meant the fourth official took over, and the club had to make an announcement if there was a qualified ref in the house (which there wasn’t). The half seemed to be drifting towards an end goal less, but from a rare Salisbury corner, centre midfielder Michael Fowler rose unmarked to head home. The goal was against the run of play but that didn’t matter to the 66 Salisbury fans (I counted – one had definitely gone missing somewhere) who celebrated a rare away goal. The second half started much were the first half left off with Woking controlling the midfield yet failing to get the ball into the penalty area. Woking’s Quamina became the fifth player booked for a late challenge that may have seen him see red on other occasions. However he soon fed the ball out wide and a decent cross for once saw Marum smartly head home to bring the scores level again. Both teams seemed resigned to the draw and another match at some point before Christmas. With a few seconds on the clock I took leave from the old wooden stand and made my way to the corner ready for a swift full time exit. As I walked around the back of the club house there was a small ripple of applause, which I put down to a good tackle or pass. I therefore waited at the corner until the ref blew for fulltime and the fans started to troop out, bemoaning the defending and “letting them steal it at the end”…so for the first time this season I had missed a goal. I could pretend and say it was marvellous but the simple truth is I have no idea. Salisbury’s Herring had scored the winner in injury time to take them through to a game versus Burton Albion or Farsley Celtic in round two.